Edited by Nelgirith at 10:21, 20 Jul 2011. Hello Heroes! The beta is unavailable right now as the patch has been launched. We forecast the maintenance to be lasting up to 24 hours, but we are working on keeping it shorter. We will keep you informed about it. I'm sure you missed Michael Day ! Janos Tujner, a CG Artist working on Heroes VI, published some really neat images presenting 3D models from the game, so go ahead and check them out. Edited by Nelgirith at 12:53, 25 Jul 2011. The first phase of Beta ends on July 25th. The second phase of Beta will start on August 9th and will last until August 20th. Some additional content and improved gameplay will be automatically available if you downloaded the Beta before July 25th via Ubishop or Steam! You can still get a Beta key by pre-ordering the game. 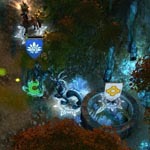 Discover the Might&Magic Heroes VI Factions Environments trailer ! Haven, Inferno, Necropolis, Stronghold and Sanctuary environments : they are all revealed in an amazing trailer with in-game footage. posted August 01, 2011 10:22 AM bonus applied by alcibiades on 01 Aug 2011. Edited by EvilP at 14:01, 02 Aug 2011. In the world of Ashan, Dragons are not mere "gigantic winged fire-breathing reptiles," but they are Ashan's primordial gods and the embodiment of magic. The natives of Ashan are aware of the Dragons' existence and hold them in respect, if not always in awe. Oaths are sworn on them, and their presence infiltrates everyday conversation. These days, only the lesser dragons walk in Ashan. Avatars of the Dragon Gods, they are a pale reflection of their true magnitude and glory. The real Dragon Gods wait in the Spirit Realm, accepting worship and awaiting the day they can return. Malassa holds sway over the shadowy and mysterious Faceless. The Dragon of Darkness is the Faceless Foe, the Slithering Shadow with a hundred faces and a thousand whispers. Darkness is a fickle and dangerous master. Darkness may seem meaningless and formless, but she knows. She has always been here and there, watching from close or afar, drinking your words and screams. In her abyssal womb lie all the forgotten memories and the buried secrets of the past. Malassa is mostly worshipped by madmen and doomsayers, fearless spies and assassins. She used to be the patron deity of the Faceless but they were almost brought to extinction during the Elder Wars. Later, she made a sinister pact with the Dark Elves (Dungeon faction). Malassa is the most elusive of the Elemental dragons. Her exact features are impossible to fathom. Her body and wings are covered in black scales, shimmering with a purple hue, but it is semi-immaterial, as if she was made of smoke, or sculpted by plays of light and shadow. On her wings, dozens of "eyes" open to peer at the unseen world and bring back forgotten secrets. Malassa never speaks, she whispers. And her words are always cryptic, so that only her most devoted worshippers can hope to understand her. Malassa's breath is a cloud of Darkness that obfuscates the senses and fills the mind with dreadful visions. Elrath leads the radiant and immortal Angels. 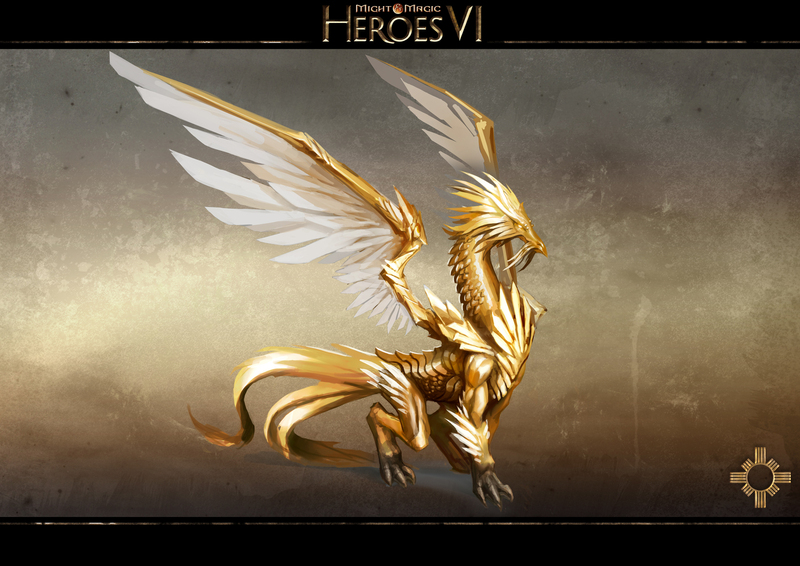 The Dragon of Light is worshipped as the Sun God and the patron of (legitimate) Authority, Truth, Honor and Justice. His servants seek to illuminate dark places, conquer evil, and celebrate individual valor and heroism. He used to be worshipped by his servants the Angels, but they were almost exterminated during the Elder Wars. In the Modern Age, Elrath became the patron deity of the Holy Empire (Haven faction). Elrath is the most resplendent of the Elemental dragons. His features are all about nobility and authority. His elegant scales are of the purest gold, but instead of merely reflecting the light, they literally shine from within. His wings are not scaly, but feathery, like his children the Angels. Elrath has no "dragon breath", but when his righteous wrath is stirred, his eyes burst into a streak of blinding light. Moderator > QP applied for always faithfully sharing news, artwork and other stuff with us here at HC. Thanx! Hi there, guys and gals, now's your chance to win a Beta key! Edited by Nelgirith at 14:16, 04 Aug 2011. She is the creator goddess, mother of Time and Space, the 3-faced icon of birth, life and death. She gave birth to the world and then hatched the six Elemental Dragons to govern it. She controls the fate of all mortals, turns the wheel of fate at their birth, controls it all along their lives and stops it at the time of their death. Asha is very cautious to remain neutral. She never takes sides with the good men or evil ones, neither Dwarves, Elves or Orcs. The whole universe is her creation. However, she is diametrically opposed to the principle of chaos embodied by her crazy twin brother and his demented sons, the Demons. After the Wars of Creation, Asha has withdrawn into a guarded shelter within the moon, to sleep, heal and dream. The Moon is actually the cocoon she has spinned around her. It's a picture of the Cosmic Egg, a means of measuring time, the last place where the Dragons can rest and also the gate to Hell (from which all souls enter Ashan and where they return after death). Asha is not directly worshiped. She is above such things, but she is served by the White Weavers, the Blind Brothers and the Silent Sisters who are helping women give birth, perform omens and funeral rites (working as midwives, seers and oracles, embalmers and funeral directors) all around the world. Note: The Necromancers (Necropolis faction) chose Asha as divine protector. However, their power and vision of Asha's powers and features is wrong and is a perversion of their deadly nature. The (always pregnant) Mother sees all things as her creation and her children. By giving life, she gives form to chaos and gives meaning to the potential. It was she who sent the first Dragons out of the Void and who created the universe and keeps making it grow. She is the "Heart", the unconditional love, the compassion for all - good and bad. The Witch is the image of death. Old and withered, she shears the thread of life with a sickle held in her gnarled fingers. She is the "Head", smart and serene, endowed with infinite wisdom and omniscient knowledge. Asha is a gigantic winged dragon, with noble shapes and full of grace, as should for the Empress and Mother of the Elemental Dragon Gods. Her features are angular rather than round, perfectly symmetrical, seemingly complex but absolutely ordered. Her scales are deep black like the void between the stars, but myriads of lights flash constantly on her skin, usually in a timely manner, like as the microscopic constellations. Her eyes shine softly with a silvery light, but they can also burst in a blinding flash, like supernovas. Her wings have such a span that they seem endless for the common man. 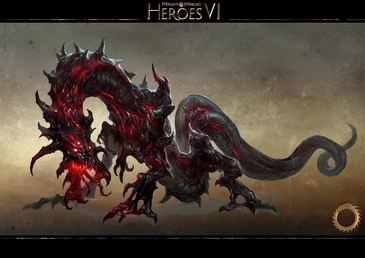 The Dragon of Chaos is a "raw and wild power", primordial chaos in his boundless energy and infinite variety of shapes. He is voracious and insatiable, he is the "snake-dragon eating his tail." He is the Father of the wanton Destruction, of the frenetic Mutation and the creeping Madness. He is also the ancestor of the Demons. Urgash is totally unpredictable. His "logic" defies the mortals' reason. One day, he can save and the next day he can kill, go from laughter to tears in seconds, switch between cruelty and comfort, etc..
Long ago, he was banned to sleep in Sheogh, the heart of Ashan, but in this prison of the world, the demons dwell and aim to achieve any of his desires. The number 0 / circle (the primordial void, the Ouroboros, the Wheel of Fortune, perfection in the revolution, the stasis in the movement, etc.).. Urgash is a colossal winged dragon, with twisted forms, constantly changing. His abilities are monstrous and horrible to contemplate. His thick black scales are never fixed and seem to be made of a hot and melted metal. Bony outgrowths (horns, spikes) are constantly erupting from his body and are instantly "reabsorbed." The blood flowing from his wounds constantly renewed is a corrosive and toxic sludge that consumes all that comes into contact with it. Urgash's body is constantly surrounded by what looks like a heat haze that "fake" reality around him. Urgash's mouth is filled with entire rows of serrated teeth, and he can open it up to an impossible width. He truly is the insatiable Devourer of worlds. After centuries of imprisonment in the burning heart of Ashan, the eyes of Urgash only reflect pain, insanity, hunger and hatred. Edited by EvilP at 14:09, 02 Aug 2011. Arkath gathers the Dwarves, grim masters of forge and fire. 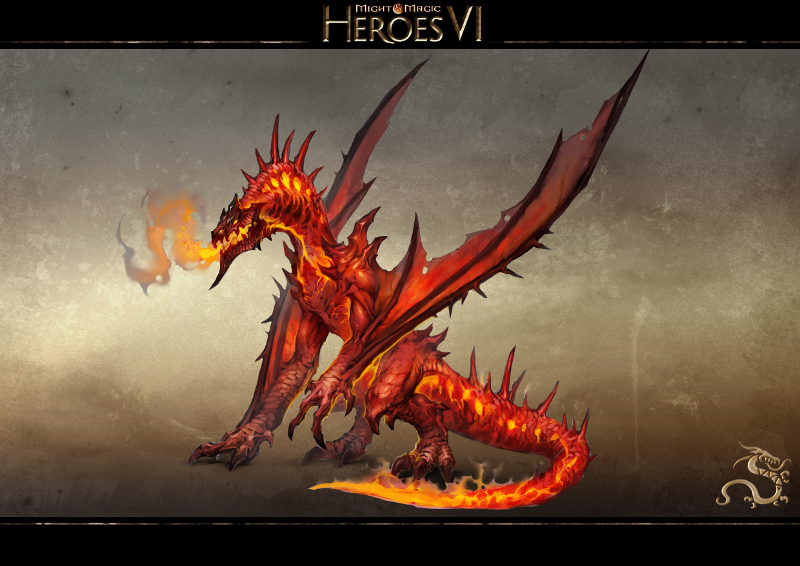 The dragon of Fire is rash, hasty, and ill-tempered. Selfish and hot-headed, ferocious in combat, he is ruled by his passions and impulses. He is mostly worshipped by the thrillseekers, those who see life as a constant struggle and burn it at both ends, but also by those who, like the blacksmiths, shed their sweat and blood as offering to the fire. Arkath is the patron deity of the Dwarves (Fortress faction). 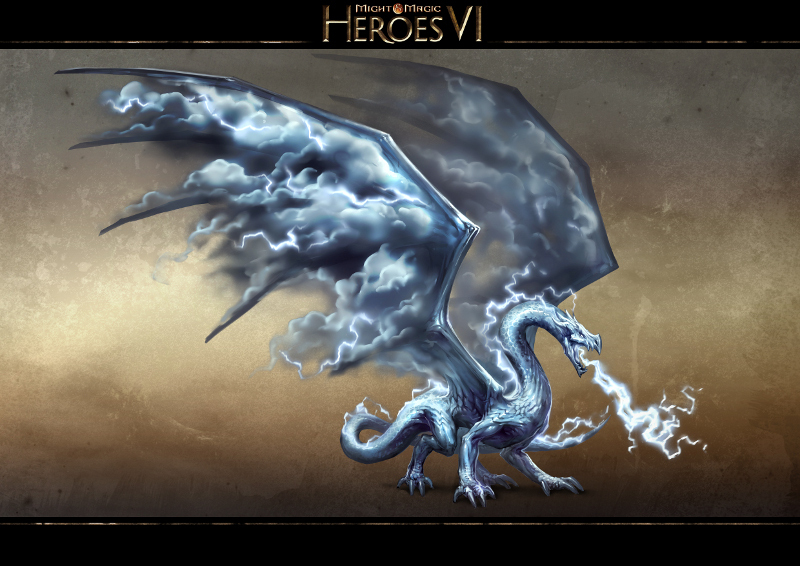 Arkath is the largest of the Elemental dragons. His features are all about physical power, ferocity and passion. His thick scales are like lava, searing hot and glowing red-gold. His breath is a stream of flames that incinerates everything it engulfs. Arkath is wingless and favors a bipedal position (standing on its rear legs to dominate its opponents). Shalassa peoples her dominion with the reptilian Naga, who move freely both in water and on the land. The Dragon of Water is humble, quiet and secretive. She is the serene mystic, wisest of the dragons, and her knowledge is only second to her sister Malassa, the Dragon of Shadow, for her watery realm is ripe with forgotten lore and treasure. Shalassa is worshipped by the sailors, fishermen and pirates, but also by the prophets, hermits and wisemen. She is the patron-deity of the Nagas (Sanctuary faction). 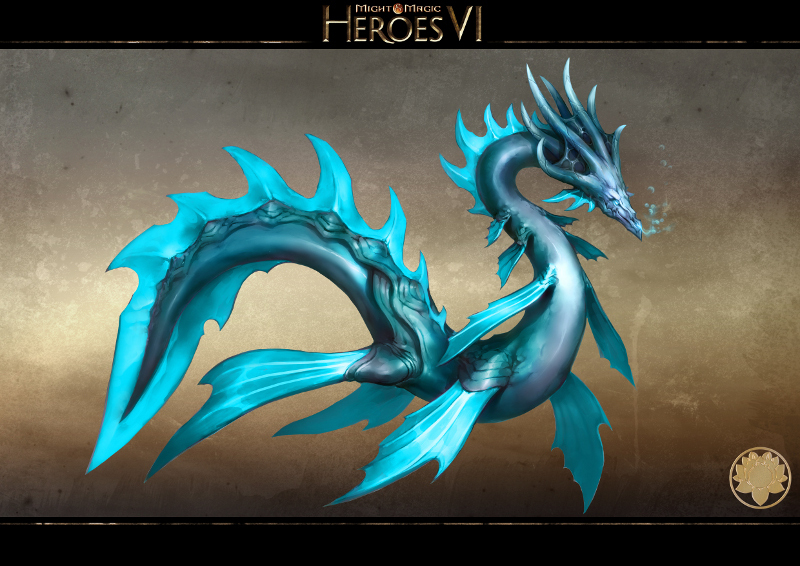 Shalassa is the most graceful of the Elemental dragons. Her features are all about serenity and wisdom. Her scales are a harmonious mix of jade-green and turquoise-blue. Shalassa is wingless and she has fins instead of legs. In fact, she looks like a sea-serpent or an Asian Dragon. Shalassa's breath can be a tidal wave, a geyser of scalding steam, or a bone-chilling blizzard. Edited by EvilP at 11:42, 03 Aug 2011. Sylanna is beloved of the Elves, silent stewards of her forests. The Dragon of Earth is the stolid, slow, even-tempered one among the Elemental Dragons. Peaceful and cautious, Earth acts only after long deliberation and study. She often serves as a peacemaker among her siblings. She is Nature's warden, being very fond of the plants, animals and living rocks that grow "on her back", and the only way to wake her wrath is to destroy or defile her sacred groves and stone circles. 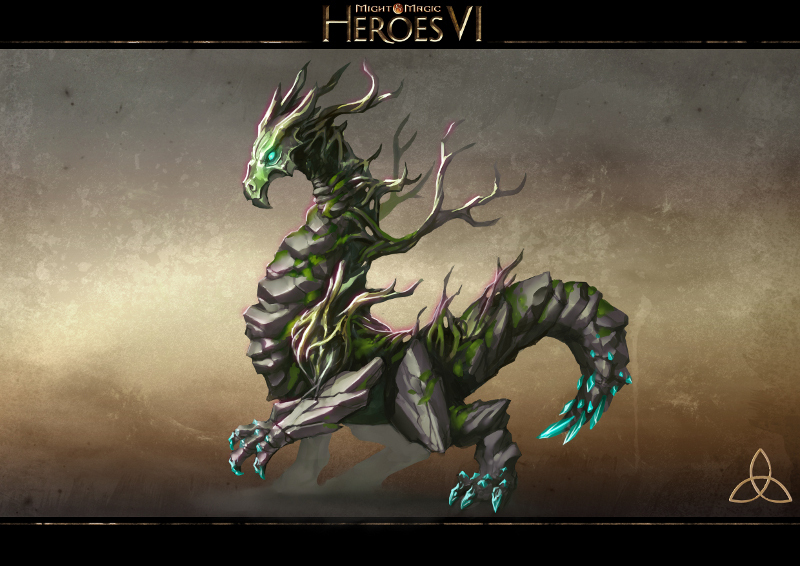 Sylanna is worshipped by druids, rangers, hunters, farmers and herders, but also by wood and stone carvers. She is the patron-deity of the Elves (Sylvan faction). Sylanna is the sturdiest of the Elemental dragons. Her features are all about resilience and quiet determination. Her thick emerald scales are diamond-hard, and always covered with moss, plants, trees, etc. Sylanna is wingless and her legs are massive and short (so that she can be closer to the ground). When angered, she can stomp with them to create tremors. Sylanna's breath is a cloud of mineral shards that can tear their targets to shreds or "petrify" them by covering them whole like a gangue. Ylath selected the Humans as his chosen people, for they are as curious and restless as he. Young and impetuous, the dragon of Air is the seeker of hazardous knowledge, of crafts that are handed down by the shortlived humans from father to child, of myriad facts about the world which he views from on high. Like the wind, he travels everywhere to collect all the sights and sounds he can pick on his way. Curious and intuitive, he is quick to sense the meaning of all things, but he is also restless and frivolous. Ylath never asked to be worshipped. His only commandment is that his followers should explore, learn, and enjoy all things in life, but mostly, that they should do as they wish, as long as they respect and honour the world that the Dragons created (this point being the crucial line drawn between Ylath and Urgash). 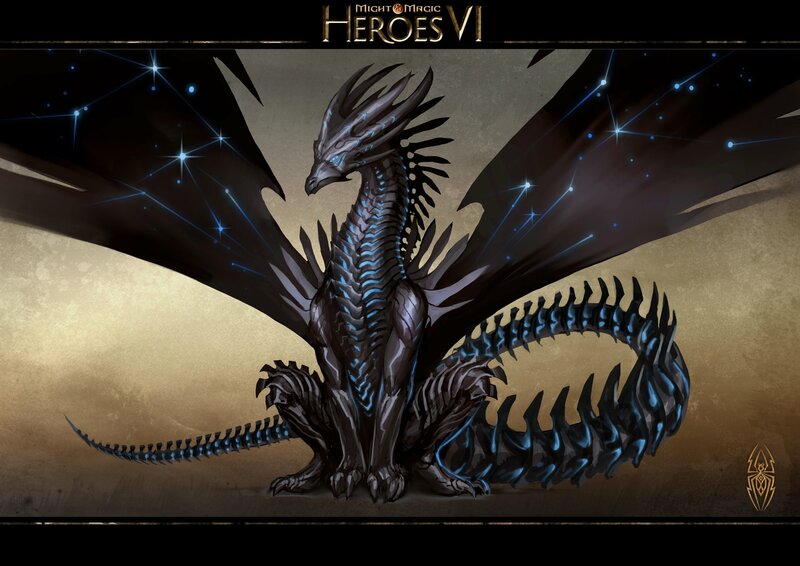 He is the patron deity of the Humans (the youngest race, as he is the youngest dragon) but has been supplanted by his elder brother Elrath, the Dragon of Light, in the Holy Empire. However, Ylath is still very popular among the nomad barbarian tribes that roam the vast territories stretching beyond the Empire, and in the federation of the Southern Free Cities. He is also honoured by the travellers, bards, and spies, by the mummers, courtiers, rakes and thieves, and even by some wizards (for his extensive arcane knowledge but also his tendency to make even the simpler facts appear "hermetic"). 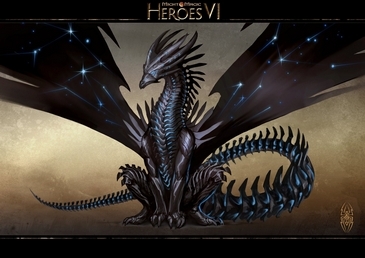 Ylath is the smallest of the Elemental dragons. His features are all about speed and agility. His delicate scales are silvery-white. His long wings seem frail, but they are powerful enough to create a whirlwind. Ylath's breath is a bolt of lightning that can strike with accurate precision. Edited by EvilP at 21:17, 11 Aug 2011. Trailer premiere on August 17th ! 1. 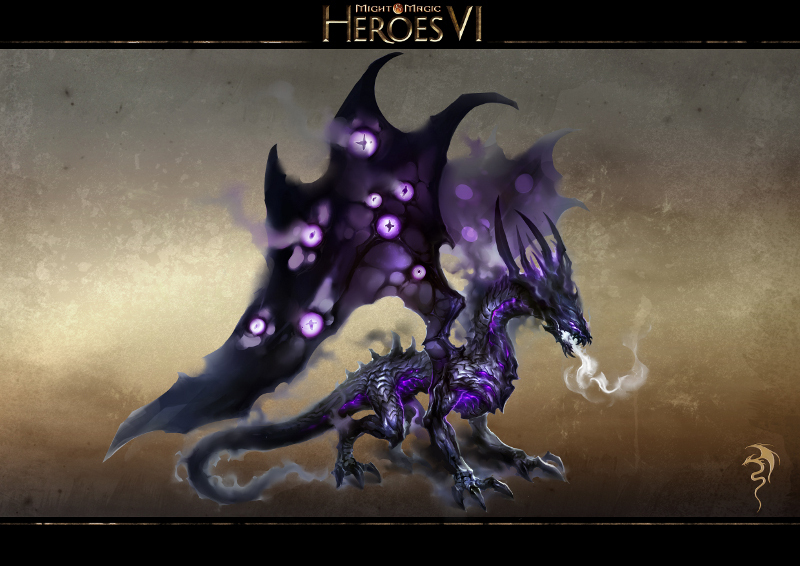 What extra features will be available in the next phase of Heroes VI beta-testing? You will be able to learn more about the extra content of the second phase of the Beta on Friday. 2. Please list all the features which will be unavailable in Heroes VI without Internet connection (in off-line mode). 3. What will be anti-copy protection of Heroes VI (disc checks, one-time online registration, etc)? The game has no DRM and you won't need to be connected to Internet to install it either. 4. Have you any plans to add alt upgrades for creatures (as in Heroes V add-on)? So far there is no official information about it alt upgrades for creatures. 5. Will you provide us detailed User Manual for Map and Campaign Editor for Heroes VI? It is planned and we will provide you with User Manuel Editor as soon as it is created. 6. What can you tell us about Random Map Generator for Heroes VI? For the moment we can only say that you will find the Random Map Generater in Heroes VI. 7. What's about modding possibilities of Heroes VI? Could you provide us some modding tools? This information will be revealed later in September. 8. What races and neutral creatures are you planning to include in the future add-ons of Heroes VI? So far there is no official information about it. 9. 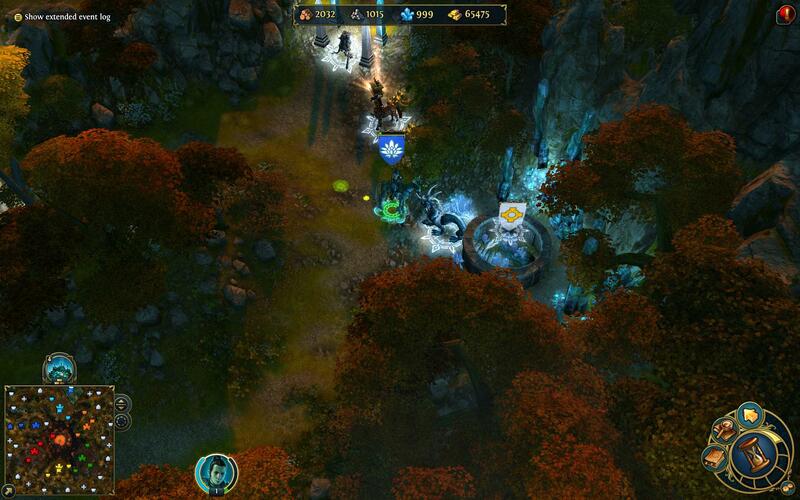 What can you tell us about future games in Might & Magic Universe? We wish to reach a broader audience by making the Might & Magic games more "accessible" (which is not synonymous with "simple"). For that we are integrating innovative concepts into the IP (the "Clash of Heroes" series for instance), but not before confronting them with our "IP commandments" and making sure they are a valuable, meaningful addition to the Might & Magic universe. The RPG category has considerably evolved over the past decades, and at Ubisoft, Might & Magic now refers to the global IP, like "Tom Clancy's" for instance, not to a specific series. We can say there's no plan for a Might & Magic X in the future, but which does not mean there won't be a "true RPG" developed within the Might & Magic universe. To prevent any misunderstandings, the part abour RMG in the latest Q&A does not mean it will be present in the game release. It has long been announced that it wouldn't and the October delay has not changed anything. Edited by EvilP at 17:38, 12 Aug 2011. - All players start a MP game with 150 minutes of gametime. It decreases during their turns. If they press the end turn button, the next player's time will decrease (basically it is the same system in Chess). If the game is not decided before the time expires for one player, then this player will be the loser. - Building the Chaos Crucible does not require Dragonblood crystals anymore. - Change from short-ranged to full-ranged unit. For decades the mighty currents of the river have separated you from your neighbour. Now that a bridge has been built on the river, you can finally pay your neighbour a visit... with a sword in your hand. A long time ago, two Dragons fought a terrible battle, and their blood was spilled all over the central island. As centuries passed, a magical Tree grew on the island, and the people living around the lake started to leave offerings between its roots. But now war has erupted between these once-peaceful nations, and victory will without a doubt be claimed by the lord who'll dare seize for himself the treasures buried around the Tree of Plenty. Six lords are trapped in a deadly little game of war for the enjoyment of the Demon Prince of Hate, Ahribban. Who will be cunning enough to defeat his enemies and turn the table on the devilish ruler of the Wheel of Hate? Edited by Elvin at 18:11, 15 Aug 2011. Sorry, leaked content not allowed. Edited by Mitzah at 18:53, 16 Aug 2011. Amazing gifts are to win! Ready? Comic strip contest is actually running on the official forum. Have you already seen fan made artworks of the art contest winners? You voted for it and the Might & Magic's team chose 4 of them! Edited by EvilP at 17:51, 30 Aug 2011. - Specific leveling curve has been created for Skirmish/Multiplayer. - The temporary 2 players limit in multiplayer is removed. Now up to 6 players can join the same game. - Chat channel is automatically generated for players in Multiplayer.